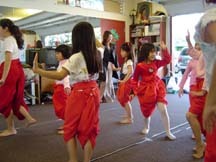 The Thai traditional dance class is taught by instructors form Chulalongkorn University of Thailand and local volunteers. Class is held on weekends during the normal school year. During Temple festivals, selected students will have the opportunity to perform for temple guests. Besides performing at the temple festivals, students have participated in cultural festivals in San Francisco Bay Area communities and universities. The annual “Thai Classical Night” is among the most recognized events held by the school every year. Tuition fee is $100 for each semester (approximately 10 weeks). Thai dance can be divided into two major categories that correspond roughly to the high art (classical dance) and low art (folk dance) distinction. Placement will be determined by our Chulalongkorn University trained instructors. Please wear something comfortable, bare feet.